SUMMARY: Parotid gland oncocytoma is an uncommon, benign salivary neoplasm composed of mitochondria-rich oncocytes. The purpose of this study was to correlate MR imaging and histopathology of parotid gland oncocytomas and to define the features that may distinguish these neoplasms from other benign and malignant parotid gland tumors. The MR imaging features in 9 patients with a pathologic diagnosis of oncocytoma were retrospectively reviewed. The imaging features were strikingly similar for 8 of the 9 patients. All lesions appeared T1 hypointense but isointense to the native parotid gland on fat-saturated T2 and postcontrast T1 imaging. On MR imaging, parotid gland oncocytomas share specific imaging characteristics that have not been described for benign or malignant parotid gland tumors. Oncocytomas are isointense to native parotid gland on fat-saturated T2 and T1 postcontrast MR images. Preoperative identification of correct histology may help surgical planning. Cytologic analysis of a parotid mass by FNAB can be useful. It must be understood, however, that despite excellent reported accuracy rates of FNAB, some parotid neoplasms are prone to diagnostic error. Thus, it has been proposed that the fine needle aspiration findings should contribute to, not replace, the overall clinical and imaging diagnostic impression.8 Infrequently, FNAB can alter the tumor histopathology to the point of obscuring final pathologic diagnosis. Inadequate specimen sampling also may occur. To this end, a large series by Capone et al9 reported sensitivity in the detection of oncocytomas by FNAB of 29%. Clearly, exclusive reliance on the results of FNAB findings at the expense of clinical and radiographic findings is unwarranted and potentially misleading. MR imaging allows for markedly improved soft tissue contrast, providing information that can help to characterize parotid gland masses. Among MR imaging features, T1WI remains invaluable in localizing parotid lesions, while determining the margin contour and relationship to adjacent structures. T2 FS WI best helps to characterize the neoplastic nature of the lesion.10 Benign mixed tumors characteristically demonstrate markedly high signal intensity similar to CSF on T2WI and heterogeneous low-to-intermediate signal intensity on T1WI, with solid enhancement. In contrast, salivary gland malignant tumors are typically low signal intensity on T2 FS WI. T1 FS C+ WI is important in detecting the perineural spread of disease and intracranial extension of disease. In addition, administration of contrast is necessary to distinguish a cyst from solid mass. The purpose of this study was to correlate MR imaging and histopathology of parotid gland oncocytomas and to define the features that distinguish these from other benign and malignant parotid gland tumors. We report the largest series reviewing the MR imaging features of parotid gland oncocytoma and histopathologic correlates to date. After approval by our institutional review board, the departments of pathology and radiology archives were reviewed to identify all parotid gland oncocytomas that had undergone MR imaging before surgery or before fine needle aspiration. Seven such cases were identified at our institution during a period of 10 years. An additional 2 cases were similarly identified at another institution and submitted for review. Clinical presentation, diagnostic imaging, surgical findings, surgical pathology, and postoperative course were analyzed in all patients. MR imaging scans were reviewed for all 9 patients. CT scans were also available for 3 of these patients, and sonography imaging was reviewed in 6 patients. All preoperative MR images were acquired on 1.5T MR imaging systems (Signa 1.5T HDX; GE Healthcare, Waukesha, Wisconsin). Our standard imaging protocol used axial and coronal T1-weighted fast spin-echo, axial and coronal fat-suppressed gadolinium-enhanced T1-weighted fast spin-echo, and fast spin-echo T2 with fat suppression sequences in the axial plane. One certificate of added qualification–certified experienced neuroradiologist and 1 neuroradiology fellowship–trained clinical instructor together reviewed the MR images, analyzing tumor margin and location, size, and T1 and T2 signal intensity characteristics and enhancement patterns. The Table illustrates our patient group and MR imaging findings. Of the 9 patients, 6 were women and 3 were men between the ages of 36 and 83 years. A painless mass was the most common presenting feature, though ipsilateral ear pain was the presenting symptom in 1 case. Imaging features among all lesions were strikingly similar. Most tumors (6/9) resided in the superficial parotid gland, with 3 also extending to the deep lobe. All oncocytomas appeared hypointense relative to native parotid tissue on T1WI, with well-demarcated margins that were lobulated in 4 cases. On T2 FS WI, 8 oncocytomas appeared isointense to the native parotid gland (Figs 1 and 2), whereas 1 mixed oncocytoma/pleomorphic adenoma was hyperintense on T2 FS WI (Fig 3 ). On T1 FS C+ WI, 8 oncocytomas appeared isointense to the native parotid gland (Figs 1 and 2), whereas 1 mixed oncocytoma/pleomorphic adenoma was heterogeneous (Fig 3). Case 1, 62-year-old female with 2-year history of firm, painless left parotid mass. A, Axial T1-weighted MR image shows a well-demarcated mass within the superficial lobe of the left parotid gland (white arrow) that is T1 hypointense. B, Axial T2-weighted MR image with fat saturation shows the mass (white arrow) to be isointense to the native parotid gland. C, Axial T1-weighted postgadolinium sequences illustrates the mass (white arrow) as isointense to the native parotid gland. Case 5, 55-year-old woman with painless “lump” behind her left ear. A, Axial T1-weighted MR image shows a well-demarcated mass within the superficial and deep lobe of the left parotid gland (white arrow) that is T1 hypointense. B, Axial T2-weighted MR image with fat saturation illustrates the mass (white arrow) to be isointense to the native parotid gland. C, Axial T1-weighted postgadolinium sequence shows the mass (white arrow) as isointense to the native parotid gland. Case 7, 75-year-old man with history of squamous cell carcinoma of the larynx status postradiation found to have an enlarging mass in the left parotid gland on surveillance imaging. A, Axial T1-weighted MR image shows a well-demarcated mass within the superficial lobe of the left parotid gland (white arrow) that is T1 hypointense. B, Axial T2-weighted MR image with fat saturation shows the mass to be hyperintense but heterogeneous to the native parotid gland. C, Axial T1-weighted postgadolinium sequence shows the mass (white arrow) to demonstrate heterogeneous enhancement to the native parotid gland. An oncocytoma is an uncommon benign parotid gland neoplasm, accounting for <1% of all salivary gland tumors.1 Due to their low prevalence, these lesions are more frequently reported in the pathology literature, with only a few case reports published that describe MR imaging features. These case reports all describe lesions to be hypointense on T2WI, but few of these papers present examples of this, and it is not clear to what tissue they are being compared.11,12 Interestingly, although Kasai et al13 describe multinodular oncocytomas in their case report as being hypointense on T2 FS WI, review of the images provided within the article undoubtedly demonstrates the multinodular lesions to be isointense to the native parotid gland and isointense to the native parotid gland on delayed T1 postcontrast imaging. Although there are no reliable distinguishing features of oncocytomas on either CT or sonography, our series suggests that MR may be able to characterize oncocytomas preoperatively. Specifically, in our series, 8 of 8 proved oncocytomas demonstrated well-demarcated contours on T1WI and appeared isointense to parotid on T1 FS C+ WI and T2 FS WI, effectively “vanishing” on T1 FS C+ WI and T2 FS WI. One additional oncocytoma that did not follow this pattern on T2 FS WI and appeared more heterogeneous and hyperintense to parotid was shown to be a mixed oncocytoma and benign mixed tumor. The origin of this vanishing behavior on T1 FS C+ WI and T2 FS MR is unknown. Our hypothesis is based upon the subcellular structure of normal parotid tissue and oncocytes. A normal parotid gland is equally composed of epithelial cells (acinar and ductal cells) and adipocytes (fat cells). 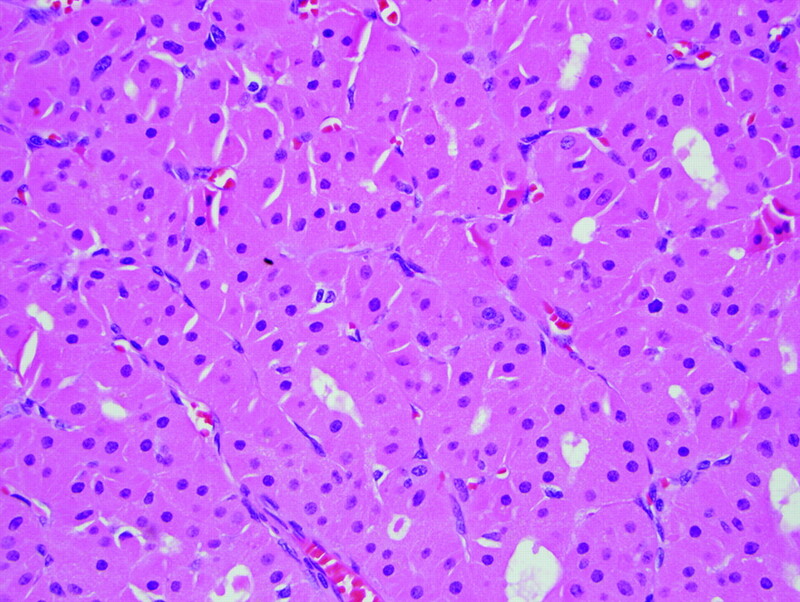 An oncocytoma consists of a pure population of oncocytes arranged in solid nests of sheets.14 Innumerable mitochondria fill the oncocytes, producing an abundant deeply eosinophilic finely granular cytoplasm, the most striking feature by light microscopy, and resulting in a paucity of other organelles (eg, DNA, protein; Fig 4).15 The cell body of the oncocytes is otherwise composed primarily of membrane lipids. The low free water content and rich lipid membrane composition might approximate the lipid content of the normal parotid gland, thereby explaining why these lesions appeared isointense to parotid gland on T1 FS C+ WI and T2 FS WI and appeared to vanish. Were this hypothesis to be correct, however, one might expect higher intrinsic T1 signal intensity on the precontrast T1WI. Management of parotid gland oncocytoma is complete surgical resection by parotidectomy. Preoperative identification of correct histology and tumor extent may help in presurgical patient preparation and in surgical planning, and in the case of a benign neoplasm, patient reassurance. Typical histologic features of a parotid gland oncocytoma including eosinophilic cells with finely granular cytoplasm and uniform, round, centrally placed nuclei (hematoxylin-eosin stain, original magnification, ×400). Parotid gland oncocytomas seem to share unique imaging characteristics that have not been described for other benign or malignant parotid gland tumors. These imaging characteristics may help in the preoperative determination of a benign parotid tumor. We found oncocytomas to be hypointense, well-demarcated lesions on T1-weighted sequences. On T1 FS C+ WI and T2 FS WI this tumor seems to vanish or become isointense to parotid tissue. Preoperative identification of correct histology may help surgical planning. We believe this further validates the utility of MR for the preoperative evaluation of neoplastic parotid masses. Paper previously presented at Annual Meeting of the American Society of Head and Neck Radiology, October 2, 2010; Houston, Texas. Disclosures: Hugh Harnsberger, Ownership Interest: Amirsys Inc. Details: CEO, Amirsys Inc., has no relationship to this paper; Christine M. Glastonbury, Consultant: Amirsys Inc. Details: Author and editor of textbook chapters; editor and author of StatDx. Ownership Interest: Amirsys. Details: Investor in company.